Assessing ASEAN's noninterference: logic of consequences or logic of appropriateness? This paper evaluates the importance of the non-interference principle in ASEAN and explains the group's steadfast adherence to it. Although ASEAN has never provided an official definition of this principle, in this paper interference is identified as ASEAN's deliberate attempts to influence the outcome of a conflict in a country without the consent of its government. Based on ASEAN's activities from 1997 to 2007, the paper argues that the non-interference principle does not actually impact ASEAN's decisionmaking about whether to interfere in a domestic conflict. However, the organization retains the principle primarily because it gives nondemocratic members of ASEAN confidence in their immunity to external intervention. Krasner also discusses two logics of action in international affairs: a logic of expected consequences and a logic of appropriateness.7 A logic of expected consequences views "political action and outcomes, including institutions, as the product of rational calculating behavior designed to maximize a given set of unexplained preferences. "8 A logic of appropriateness sees "political action as a product of rules, roles, and identities that stipulate appropriate behavior in given situations. "9 The debate over ASEAN's non-interference principle centers on the question of whether its adoption follows a logic of expected consequences or a logic of appropriateness. In other words, scholars still disagree whether ASEAN adheres to the principle because of its practical benefits or because of its virtues. However, a logic of appropriateness cannot explain why ASEAN intervened in the domestic affairs of Cambodia in 1997 or those of Myanmar after 2003. Those aforementioned scholars merely dismiss these cases as exceptions in an otherwise consistent pattern of ASEAN noninterference. They fail to recognize that these were the only post-Cold War political conflicts that occurred in small and weak Southeast Asian states, while all the ones that ASEAN remained silent about related directly to big regional players. In contrast, other scholars adopt a realist perspective and explain ASEAN's noninterference principle based on a logic of consequences.15 According to this view, ASEAN countries stick to the noninterference principle because it protects member states with illiberal regimes. It can be relaxed on occasion to soothe international criticisms of ASEAN inaction, but overall, the organization's concern for regime security is predominant.16 Khoo and Jones highlight cases where ASEAN countries have interfered in others' internal affairs to argue that the non-interference principle is applied flexibly to best serve certain states' interests.17 However, these scholars' focus on the instances where ASEAN violated its non-interference principle (termed "violation cases" hereafter) overlooks those where it did not (termed "non-violation cases" hereafter). They fail to completely rule out the possibility that these interventions were just exceptions to ASEAN's norm of non-interference. Overall, existing scholarship fails to offer a systematic analysis of ASEAN's responses to political and security conflicts in the region and their implications for understanding the non-interference principle. Instead, they only provide disconnected examples and anecdotes to support their arguments. This method also makes it difficult to identify patterns in ASEAN's adherence to the noninterference principle over time and across cases. 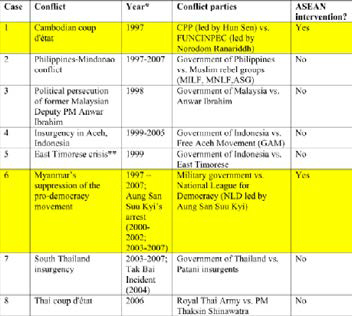 During these ten years, ASEAN only intervened in two cases: the coup in Cambodia (1997) and the political persecution of Aung San Suu Kyi in Myanmar (cases 1 and 6). It is tempting to conclude that these cases are only rare exceptions to the norm. However, closer examination reveals that all cases of non-interference are related directly to the founding members of ASEAN – Thailand (case 7 and 8), Indonesia (case 4 and 5), the Philippines (case 2) and Malaysia (case 3). These countries are also the most advanced economies in the region. In 2002, for instance, Indonesia's GDP comprised 30% of the region's total GDP and was the biggest ASEAN economy.19 Thailand was the second biggest with 19.5% of ASEAN's total GDP, while Malaysia and the Philippines contributed 15.5% and 12.5% of ASEAN's total GDP respectively. In contrast, Cambodia and Myanmar were among the poorest countries in the region. In 2002, Myanmar's GDP was only 1.2% of ASEAN's total GDP while Cambodia was the second poorest state with only 0.66% of ASEAN's total GDP. Moreover, both Myanmar and Cambodia were relatively new members of ASEAN; Cambodia was still applying for the membership when the coup happened. These two cases of ASEAN interference in the domestic affairs of Myanmar and Cambodia suggest a double standard in adherence to the non-interference principle: the organization upholds the principle whenever conflicts occur within its powerful members (Thailand, Indonesia, the Philippines, Singapore and Malaysia) are primary parties, but can interfere when they involve its poorer and weaker members. To further assess and analyze this pattern, the following sections examine the two cases of norm violation and then discuss the non-violation ones. A military dictatorship took over the government of Myanmar in 1989.26 The junta refused to convene the parliament and transfer power to the National League for Democracy (NLD), led by Aung San Suu Kyi, despite the NLD's landslide victory in the 1990 national election. Aung San Suu Kyi was placed under house arrest from 1989 to 1995, and then again from 2000 to 2002, and 2003 to 2007. Unlike Cambodia, Myanmar was admitted into ASEAN in 1997 despite strong objections by the US and EU due to Myanmar's poor human rights and democracy record.27 With abundant natural resources, Myanmar was a potential engine of economic growth for ASEAN.28 ASEAN did not want to delay Myanmar's entry into ASEAN because it worried that Myanmar might get closer to China as a result.29 ASEAN justified its admission of Myanmar with the concept of "constructive engagement", promising to encourage political liberalization in Myanmar by helping it develop its economy.30 This "constructive engagement", however, proved unsuccessful when the military junta in Myanmar put Aung San Suu Kyi under house arrest for the third time in 2003. After this, the Western powers put more pressure on ASEAN to resolve the issue. The EU boycotted any meeting or cooperation project with ASEAN that Myanmar participated in.31 Washington also stalled free-trade talks with ASEAN to signal its disapproval of Myanmar's political behavior. Although the conflicts in Myanmar and Cambodia differed in nature and length, ASEAN received tremendous international pressure in both cases to intervene, especially for Myanmar. Although the conflicts in Myanmar and Cambodia differed in nature and length, ASEAN received tremendous international pressure in both cases to intervene, especially for Myanmar. One can argue that because both countries have abundant natural resources and border many ASEAN countries, ASEAN was particularly concerned about their stability. Nevertheless, ASEAN was reluctant to break the non-interference principle in both cases before it came under significant pressure from its top trade partners. This suggests that international pressure, in addition to the relative power of the states involved, is an important factor in these cases. 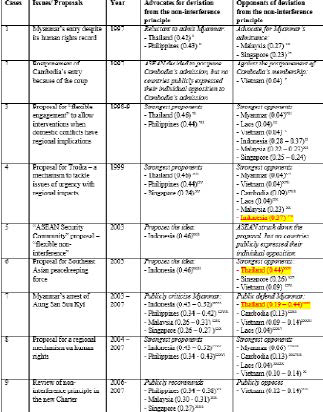 However, as the following sections show, when ASEAN's powerful members are directly involved, even international pressure cannot force ASEAN to break its golden rule of non-interference. 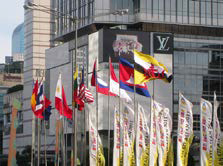 The flags of ASEAN flying during the 18th ASEAN Summit in Jakarta. To examine the effectiveness of a norm, one not only needs to look for violations, but also to evaluate whether actors would still behave in the same way without the norm.39 I argue that the involvement of powerful states, not the non-interference principle, was the reason why ASEAN refused to interfere in the non-violation cases. The East Timorese crisis is a telling example. East Timor was Indonesia's colony for more than 30 years. In 1998, in a referendum organized by UN peacekeeping forces, 79.5 percent of East Timorese voted for independence from Indonesia.40 Immediately after that, the pro-Indonesian Timorese militia, armed by the Indonesian army, killed approximately 1,200 civilians in East Timor.41 Similar to the conflicts in Cambodia and Myanmar, the East Timorese crisis also attracted much international attention. Its timing (1999) was close to that of Cambodia's coup and was during the period when ASEAN was trying to shore up its standing after the Asian Financial crisis. It is no surprise that ASEAN remained silent regarding the conflicts in Mindanao (Philippines), Aceh (Indonesia), southern Thailand, the political persecution of a former Malaysian deputy prime minister, and the 2006 coup in Thailand. Abbugao, Martin. "ASEAN Charter Aims to Protect Human Rights, Uphold Democracy: Draft." Agence France-Presse 9 Nov. 2007. Web. 13 Jan. 2015. Acharya, Amitav. Constructing a Security Community in Southeast Asia: ASEAN and the Problem of Regional Order. Routledge, 2009. Print. AFP. "Myanmar Says Will Accept ASEAN Envoy's Visit." Agence France-Presse 12 Dec. 2005. Web. 13 Jan. 2015. "Nine Killed as Myanmar Junta Cracks down on Protests." Agence France-Presse 27 Sept. 2007. Web. 13 Jan. 2015. "Thai PM Warns of ASEAN Walkout If Row Starts over Muslim Protester Deaths." Agence France-Presse 25 Nov. 2004. Web. 13 Jan. 2015. Alford, Peter. "Neighbours Fear Burma." Australian, The/Weekend Australian/Australian Magazine, The (Australia) 10 July 1998: 007. Print. "Thais Push Radical Shift in ASEAN." Australian, The/Weekend Australian/Australian Magazine, The (Australia) 6 July 1998: 006. Print. ASEAN. "ASEAN." N.p., n.d. Web. 13 Jan. 2015. BBC. "ASEAN Chief Doubts Influence of Malaysian Ultimatum on Burma." BBC Monitoring International Reports 31 Mar. 2005. Web. 13 Jan. 2015. "ASEAN Foreign Ministers Differ on Embracing Globalization Trend." BBC Monitoring International Reports 25 July 2000. Web. 13 Jan. 2015. "Indonesia Opposes Changing ASEAN's Nonintervention Policy." BBC Monitoring International Reports 15 July 1998. Web. 13 Jan. 2015. "Vietnamese, Burmese Leaders Discuss ASEAN, Regional, Bilateral Issues." BBC Monitoring International Reports 11 Aug. 2004. Web. 13 Jan. 2015. "Vietnam Offers Refuge to Foreigners Fleeing Cambodia." BBC Monitoring International Reports 12 July 1997. Web. 13 Jan. 2015. Bernama. "Vietnam Benefit from ASEAN's Non-Interference Stance." Bernama: The Malaysian National News Agency (Malaysia) 27 Jan. 2007. Web. 13 Jan. 2015. Burton, John. "Leadership Change in Burma Tests Asean's Relations with US and EU." Financial Times 21 Oct. 2004. Financial Times. Web. 13 Jan. 2015. "Malaysia Heads Calls for Burma to Be Barred from Taking over." Financial Times (London, England) 28 Mar. 2005: 06. Print. Caballero-Anthony, Mely. "Partnership for Peace in Asia: ASEAN, the ARF, and the United Nations." Contemporary Southeast Asia 24.3 (2002): 528–548. Print. Caballero-Anthony, Mely, and Amitav Acharya. "UN Peace Operations and Asian Security." UN Peace Operations and Asian Security. Routledge, 2005. Print. Chong, Florence. "Trouble-Shooters Look out for the next Big Disaster." Australian, The/Weekend Australian/Australian Magazine, The (Australia) 26 July 2000: 031. Print. Cotton, James. "Against the Grain: The East Timor Intervention." Survival 43.1 (2001): 127–142. Print. "The Emergence of an Independent East Timor: National and Regional Challenges." Contemporary Southeast Asia (2000): 1–22. Print. "Data | The World Bank." N.p., n.d. Web. 13 Jan. 2015. Doyle, Michael W., and Nicholas Sambanis. Making War and Building Peace United Nations Peace Operations. Princeton, NJ: Princeton University Press, 2006. Print. DPA. "ASEAN to Reiterate Call for Myanmar to Increase ‘Democratic Space.'" Deutsche Press-Agentur 25 Oct. 2004. Web. 13 Jan. 2015. "Bold Moves Proposed to Prevent ASEAN from Atrophy." Deutsche Press-Agentur 6 Jan. 2007. Web. 13 Jan. 2015. "Indonesian President Slams Unilateralism, Promotes Dialogue." Deutsche Press-Agentur 30 June 2004. Web. 13 Jan. 2015. "Singapore Concerned over Myanmar's National Reconciliation Process." Deutsche Press-Agentur 22 Oct. 2004. Web. 13 Jan. 2015. Dupont, Alan. "ASEAN's Response to the East Timor Crisis." (2000): n. pag. Google Scholar. Web. 13 Jan. 2015. "Freedom House." N.p., n.d. Web. 13 Jan. 2015. Funston, John. "ASEAN: Out of Its Depth?" Contemporary Southeast Asia (1998): 22–37. Print. García, María del Mar Hidalgo. "The Ethnic Conflicts in Myanmar: Kachin." Geopolitical Overview of Conflicts 2013. Instituto Español de Estudios Estratégicos, 2013. 341–368. Google Scholar. Web. 13 Jan. 2015. Garran, Robert. "Ministers Put Good Neighbours before Good Sense." Australian, The/Weekend Australian/Australian Magazine, The (Australia) 28 July 1998: 013. Print. Haacke, Jürgen. "ASEAN's Diplomatic and Security Culture: A Constructivist Assessment." International Relations of the Asia-Pacific 3.1 (2003): 57–87. Print. Helmke, Belinda. "The Absence of ASEAN: Peacekeeping in Southeast Asia." Pacific News 31 (2009): 4–6. Print. "IMF DataMapper." N.p., n.d. Web. 13 Jan. 2015. "Indonesia | Freedom House." N.p., n.d. Web. 13 Jan. 2015. Iran News. "Southeast Asia Lays Path for Future." Iran News (Iran) 14 Jan. 2007. Web. 13 Jan. 2015. "Joint Communique of the 30th ASEAN Ministerial Meeting." Subang Jaya, Malaysia: N.p., 1997. Web. 13 Jan. 2015. "Joint Communique of the 39th ASEAN Ministerial Meeting." Kuala Lumpur: N.p., 2006. Web. 13 Jan. 2015. Jones, Lee. "ASEAN Intervention in Cambodia: From Cold War to Conditionality." The Pacific Review 20.4 (2007): 523–550. Print. "ASEAN's Unchanged Melody? The Theory and Practice of ‘non-Interference'in Southeast Asia." The Pacific Review 23.4 (2010): 479–502. Print. Kazmin, Amy. "Singapore Warns of North Asian Economic Threat: Asean Urged to Speed up Financial Reforms or Face Becoming ‘Irrelevant.'" Financial Times (London, England) 25 July 2000: 1. Print. "Suu Kyi Arrest Threatens Asean Credibility: Burma Will Present Plans for Democracy at This Week's Bali Summit. They Are Unlikely to Win over Sceptics. Amy Kazmin Reports." Financial Times (London, England) 6 Oct. 2003: 2. Print. Khoo, Nicholas. "Deconstructing the ASEAN Security Community: A Review Essay." International Relations of the Asia-Pacific 4.1 (2004): 35–46. Print. Krasner, Stephen D. Sovereignty: Organized Hypocrisy. Princeton University Press, 1999. Print. Kyodo News International. "ASEAN Official Complete Drafting of Landmark Charter." Kyodo News International, Inc. 22 Oct. 2007. Web. 13 Jan. 2015. Lee, Kim Chew. "ASEAN Urges Myanmar to Accept Role of the UN." Straits Times, The (includes Sunday Times and Business Times) (Singapore) 17 June 2003. Web. 13 Jan. 2015. "Peacekeeper Plan for Region Shelved Jakarta's Proposal Fails to Get Support from Its Partners in Asean Which Say It Is Too Costly and Premature." Straits Times, The (includes Sunday Times and Business Times) (Singapore) 29 June 2004. Web. 13 Jan. 2015. "Potential for Action Shows There's Life in Asean yet." Straits Times, The (includes Sunday Times and Business Times) (Singapore) 24 July 2000: 30. Print. Levy, Marc A., and Marc A. Levy. "European Acid Rain: The Power of Tote-Board Diplomacy." Institutions for the Earth: Sources of Effective International Environmental Protection. Ed. Peter M. Haas and Robert O. Keohane. MIT Press, 1993. Print. Manila Standard Today. "Asean Dared to Act on Myanmar." Manila Standard Today (Philippines) 7 Apr. 2005. Web. 13 Jan. 2015. Mansor, Lokman. "PM: We Support Sanctions against Errant Members." New Straits Times (Kuala Lumpur, Malaysia) 14 Jan. 2007. Web. 13 Jan. 2015. Manthorpe, Jonathan. "Economic Club Opens Arms for Mynamar." Hamilton Spectator, The (Ontario, Canada) 7 Dec. 1996: D12. Print. "NewsBank InfoWeb." N.p., n.d. Web. 13 Jan. 2015. France-Presse 27 Sept. 2007. Web. 13 Jan. 2015. Peachey, Paul. "Thailand Faces Tough Questions but Likely to Escape Censure at ASEAN Summit." Agence France-Presse 23 Nov. 2004. Web. 13 Jan. 2015. Peou, Sorpong. "The Subsidiarity Model of Global Governance in the UN-ASEAN Context." Global governance 4 (1998): 439. Print. Purba, Kornelius. "Building ‘Non-Interference.'" WorldSources Online 15 Oct. 2003. Web. 13 Jan. 2015. Ramcharan, Robin. "ASEAN and Non-Interference: A Principle Maintained." Contemporary Southeast Asia (2000): 60–88. Print. Saengchan, Nattapol. "Undesirable Consequences of an ASEAN Peacekeeping Force." Jakarta Post 2 Mar. 2004. Web. 13 Jan. 2015. Severino, Rodolfo C. "Sovereignty, Intervention and the ASEAN Way." ASEAN Scholars' Roundtable. Singapore. 2000. Siangkin. "Is There a Lack of Focus in Indonesia's Foreign Policy?" Straits Times, The (includes Sunday Times and Business Times) (Singapore) 2 Oct. 2000: 44. Print. "Manila to Invoke Principle of Non-Intervention." Straits Times, The (includes Sunday Times and Business Times) (Singapore) 21 July 2000: 38. Print. Singapore, Amy Kazmin in. "Asean Charter Falls Foul of Burma Divisions." Financial Times (London, England) 21 Nov. 2007. Web. 13 Jan. 2015. Singer, J. David. "Reconstructing the Correlates of War Dataset on Material Capabilities of States, 1816–1985." International Interactions 14.2 (1988): 115–132. Print. Singer, J. David, Stuart Bremer, and John Stuckey. "Capability Distribution, Uncertainty, and Major Power War, 18201965." Peace, war, and numbers 19 (1972): n. pag. Google Scholar. Web. 13 Jan. 2015. Stewart, Ian. "ASEAN Divides over Intervention Plan." Australian, The/Weekend Australian/Australian Magazine, The (Australia) 20 July 1998: 007. Print. "Thailand | Freedom House." N.p., n.d. Web. 13 Jan. 2015. The Straits Times. "Asean's Peace." Straits Times, The (includes Sunday Times and Business Times) (Singapore) 8 Mar. 2004. Web. 13 Jan. 2015. "Thailand to Push for ‘Troika' Plan to Act in Crises." Straits Times, The (includes Sunday Times and Business Times) (Singapore) 19 July 2000: 30. Print. The Washington Times. "Telling It like It Is to ASEAN." Washington Times, The (DC) 4 Aug. 1997: A18. Print. Timberlake, Ian. "Southeast Asia Takes ‘Breakthrough' Step toward Regional Rights Body." Agence France-Presse 25 July 2005. Web. 13 Jan. 2015. Torode, Greg. "Crisis-Hit Nations to ‘Usher in' New Order." South China Morning Post (Hong Kong) 4 July 1998: 11. Print. "UCDP/PRIO Armed Conflict Dataset." N.p., 2014. Web. 13 Jan. 2015. Wheeler, Nicholas J., and Tim Ddunne. "East Timor and the New Humanitarian Interventionism." International Affairs 77.4 (2001): 805–827. Print. Jonathan Manthorpe, “Economic Club Opens Arms for Mynamar,” Hamilton Spectator, The (Ontario, Canada), December 7, 1996, FINAL edition. “Vietnam Offers Refuge to Foreigners Fleeing Cambodia - Japanese Report,” BBC Monitoring International Reports, July 12, 1997, http://infoweb.newsbank.com/resources/doc/nb/news/0F99F5D92E430FE4?p=AWNB. Peter Alford, “Thais Push Radical Shift in ASEAN,” Australian, The/Weekend Australian/Australian Magazine, The (Australia), July 6, 1998, 1 edition. Peter Alford, “Neighbours Fear Burma,” Australian, The/Weekend Australian/Australian Magazine, The (Australia), July 10, 1998, 1 edition. Greg Torode, “Crisis-Hit Nations to ‘Usher in’ New Order,” South China Morning Post (Hong Kong), July 4, 1998, 2 edition. “Indonesia Opposes Changing ASEAN’s Nonintervention Policy,” BBC Monitoring International Reports, July 15, 1998, http://infoweb.newsbank.com/resources/doc/nb/news/0F98E44997028BED?p=AWNB. Ian Stewart, “ASEAN Divides over Intervention Plan,” Australian, The/Weekend Australian/Australian Magazine, The (Australia), July 20, 1998, 1 edition. “Thailand to Push for ‘Troika’ Plan to Act in Crises,” Straits Times, The (includes Sunday Times and Business Times) (Singapore), July 19, 2000. “ASEAN Foreign Ministers Differ on Embracing Globalization Trend,” BBC Monitoring International Reports, July 25, 2000, http://infoweb.newsbank.com/resources/doc/nb/news/0F97DCB197842F3A?p=AWNB. Kim Chew Lee, “Potential for Action Shows There’s Life in Asean yet,” Straits Times, The (includes Sunday Times and Business Times) (Singapore), July 24, 2000. Amy Kazmin, “Singapore Warns of North Asian Economic Threat: Asean Urged to Speed up Financial Reforms or Face Becoming ‘Irrelevant,’” Financial Times (London, England), July 25, 2000, USA Ed2 edition. Siangkin, “Is There a Lack of Focus in Indonesia’s Foreign Policy?,” Straits Times, The (includes Sunday Times and Business Times) (Singapore), October 2, 2000. Kornelius Purba, “Building ‘Non-Interference,’” WorldSources Online, October 15, 2003, http://infoweb.newsbank. com/resources/doc/nb/news/0FE3C061A81B689A?p=AWNB. The (includes Sunday Times and Business Times) (Singapore), June 29, 2004, http://infoweb.newsbank.com/resources/doc/nb/news/10382BB397AEEDE8?p=AWNB. “Undesirable Consequences of an ASEAN Peacekeeping Force,” WorldSources Online, March 2, 2004, http://infoweb.newsbank.com/resources/doc/nb/news/101170A261AEB861?p=AWNB. “Asean’s Peace,” Straits Times, The (includes Sunday Times and Business Times) (Singapore), March 8, 2004, http://infoweb.newsbank.com/resources/doc/nb/news/1012EE02450C0526?p=AWNB. “Indonesian President Slams Unilateralism, Promotes Dialogue,” Deutsche Press-Agentur, June 30, 2004, http://infoweb.newsbank.com/resources/doc/nb/news/1038A7DA897A2B9E?p=AWNB. “ASEAN to Reiterate Call for Myanmar to Increase ‘Democratic Space,’” Deutsche Press-Agentur, October 25, 2004, http://infoweb.newsbank.com/resources/doc/nb/news/106D64150A9254A8?p=AWNB. “ROUNDUP: Singapore Concerned over Myanmar’s National Reconciliation Process,” Deutsche Press-Agentur, October 22, 2004, http://infoweb.newsbank.com/resources/doc/nb/news/105E37BFA309C164?p=AWNB. “Malaysia Heads Calls for Burma to Be Barred from Taking over,” Financial Times (London, England), March 28, 2005, London Ed1 edition. “ASEAN Chief Doubts Influence of Malaysian Ultimatum on Burma,” BBC Monitoring International Reports, March 31, 2005, http://infoweb.newsbank.com/resources/doc/nb/news/10934EBC704090A0?p=AWNB. “Vietnamese, Burmese Leaders Discuss ASEAN, Regional, Bilateral Issues,” BBC Monitoring International Reports, August 11, 2004, http://infoweb.newsbank.com/resources/doc/nb/news/1046D6F5B164ADEF?p=AWNB. Ian Timberlake, “Southeast Asia Takes ‘Breakthrough’ Step toward Regional Rights Body,” Agence France-Presse, July 25, 2005, http://infoweb.newsbank.com/resources/doc/nb/news/10B982B862EE0058?p=AWNB. “Southeast Asia Lays Path for Future,” Iran News (Iran), January 14, 2007, http://infoweb.newsbank.com/resources/ doc/nb/news/11C7824E0599DA68?p=AWNB. “ASEAN Official Complete Drafting of Landmark Charter,” Kyodo News International, Inc., October 22, 2007, http://infoweb.newsbank.com/resources/doc/nb/news/11C774790F713388?p=AWNB. Amy Kazmin in Singapore, “Asean Charter Falls Foul of Burma Divisions,” Financial Times (London, England), November 21, 2007, http://infoweb.newsbank.com/resources/doc/nb/news/11D19704A8424E10?p=AWNB. Lokman Mansor, “PM: We Support Sanctions against Errant Members,” New Straits Times (Kuala Lumpur, Malaysia), January 14, 2007, http://infoweb.newsbank.com/resources/doc/nb/news/116B094433728070?p=AWNB. “Bold Moves Proposed to Prevent ASEAN from Atrophy,” Deutsche Press-Agentur, January 6, 2007, http://infoweb.newsbank.com/resources/doc/nb/news/11683673268757A0?p=AWNB. “Vietnam Benefit from ASEAN’s Non-Interference Stance,” Bernama: The Malaysian National News Agency (Malaysia), January 27, 2007, http://infoweb.newsbank.com/resources/doc/nb/news/1182C0733A457EE8?p=AWNB. The ten countries are Indonesia, Malaysia, the Philippines, Singapore, Thailand, Brunei, Cambodia, Laos, Myanmar, and Vietnam. This conflict is included because East Timor was Indonesia’s colony and ASEAN referred to this conflict as an internal issue for Indonesia (Dupont 163). Freedom House measures states’ political rights and civil liberties on a scale from 1 (most democratic) to 7 (least democratic). More details on the calculation method are given in Appendix A. More details on sources for Table 2 are listed in Appendix B. Data sources: GDP -“IMF DataMapper.”; Population - “Data | The World Bank,” accessed January 13, 2015, http://data.worldbank.org/; Military expenditures - J. David Singer, Stuart Bremer, and John Stuckey, “Capability Distribution, Uncertainty, and Major Power War, 1820-1965,” Peace, War, and Numbers 19 (1972), http://www.correlatesofwar.org/COW2%20Data/Capabilities/nmc4.htm; J. David Singer, “Reconstructing the Correlates of War Dataset on Material Capabilities of States, 1816–1985,” International Interactions 14, no. 2 (1988): 115–32. By Gunawan Kartapranata (Own work) ASEAN Nations Flags in Jakarta 3.jpg 2011[CC-BY-SA-3.0 (https://commons.wikimedia.org/wiki/File:ASEAN_Nations_Flags_in_Jakarta_3.jpg)], via Wikimedia Commons. By Francois Polito (Own work) Manifestion pour la liberation de aung san suu kyi au siege de l ONU a new york.jpg 2003 [CC-BY-SA-3.0 (https://commons.wikimedia.org/wiki/File:Manifestion_pour_la_liberation_de_aung_san_suu_ kyi_au_siege_de_l_ONU_a_new_york.jpg)], via Wikimedia Commons.